You’ve seen all of the action coming out of Dreamforce this past month, are you more determined than ever to get there yourself next year? The dates have been announced as 25th-28th September 2018. As Dreamforce sells out early, and the prices of flights and accommodation rise quickly as the event gets closer, what better time to start talking to your manager about sending you to Dreamforce 2018 than now? What do managers always want to hear before signing on the dotted line? Numbers. Dreamforce is no doubt an expensive conference to attend, but as regular attendees ourselves, we believe it’s invaluable. We want to help you not only build your business case with numbers to back up the return on investment but help you to give you an objective to get the most it when you do actually get there. Dreamforce is the biggest Tech conference globally, attracting upwards of 170,000 visitors to San Francisco annually over a 4 day period. For someone who hasn’t been themselves, the perception of Dreamforce could (mistakenly) be that it’s either like many of the other conventions, only larger and overseas. Or that it’s one big party, after all, how will Dreamfest, with free alcohol and performances by headliners such as U2 or Lenny Kravitz affect my bottom line exactly….? We thought we’d help you answer that question. Dreamforce is made up of over 2,000 sessions. More than 1,000 classroom-style presentations, plus another 1,000 informal sessions. If you’re a working in a Salesforce team and are struggling with a problem that can’t seem to be solved, Dreamforce is absolutely worth the investment. With over 1,000 breakout and hands-on-training sessions, the opportunity to attend Success Clinics with 1:1 support, this is a priceless opportunity to ask your questions and discover the solution. Networking at Dreamforce is a great way to grow anyone’s knowledge base and stretch and inspire a different way of thinking by being exposed to problem-solving and case studies. For both Salesforce professionals and Salesforce users. Salesforce promotes crowd-sourced information and case studies through the use of theatre, and it’s incredibly effective. The opportunity to promote your brand. Generate leads via networking events and one-on-one conversations, represent the services that you’re able to deliver, what capability you can bring to the table, and your value-add. Plan in advance how you might best be reachable when you’re there (text, Twitter, LinkedIn etc. ), and also how you’ll reconnect with the new contacts you make there, post-event. The opportunity to build the right way. A lot of the sessions and keynotes are streamed live during and after the event. A lot are not. Stream what you can online, and then visit the agenda and collate which sessions you were unable to access as a result of not being at the conference itself. Then reference what value you could have garnered from them. Think about a couple of long-term projects and strategies you have within your organisation. 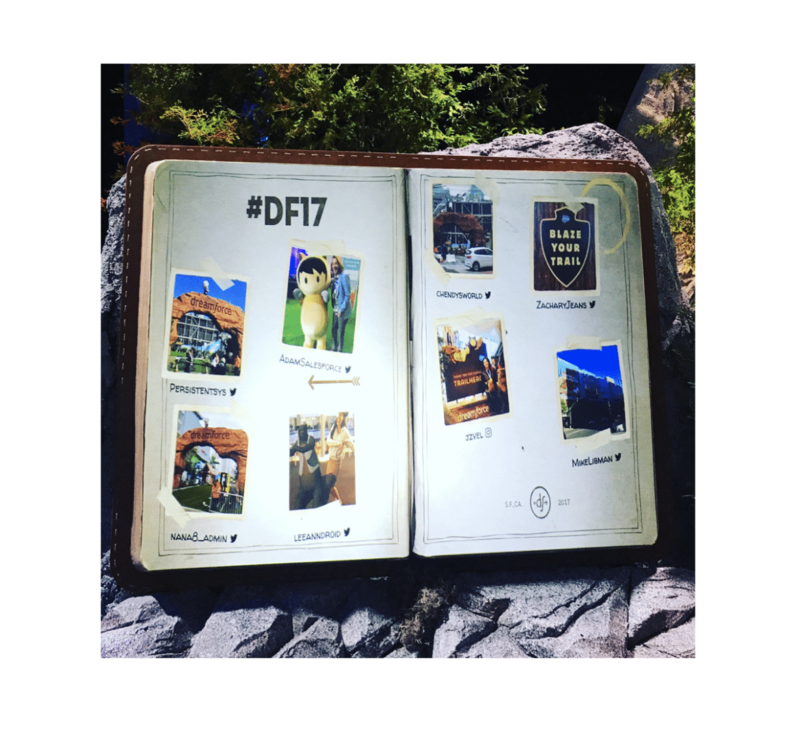 These will be your objectives to seek inspiration or solutions for when you’re at Dreamforce. Agree to set one actionable item that will have an immediate impact on your return. If you’re a Marketers or a business User, rather than a Salesforce professional, you’ll see the latest in journey management and brand experience to make sure that you’re nurturing your customers in the most friction-free way possible, and make sure there are no missed opportunities in your processes. An idea of what is in the pipeline and where the platform is going will ensure that you’re making the right decisions in your business based on updates and new releases which will better meet your goals down the track. Not being exposed to these could leave you on the back-foot. There are a huge array of product demonstrations, which gives you an opportunity to try before you buy, and give you an invaluable peek into what’s possible. With thousands of the world’s leading Salesforce experts, and endless over 2,000 sessions, Dreamforce is literally a powerhouse of knowledge and answers. It would be near on impossible not to come away without a host of new learnings. A peek into how industry-leading organisations from a broad range of sectors how they’re seeing the most benefit from their Salesforce capability. Attending Dreamforce is proven to maximise your return on investment. 96% of attendees surveyed have said that the business improvements have outweighed the cost. 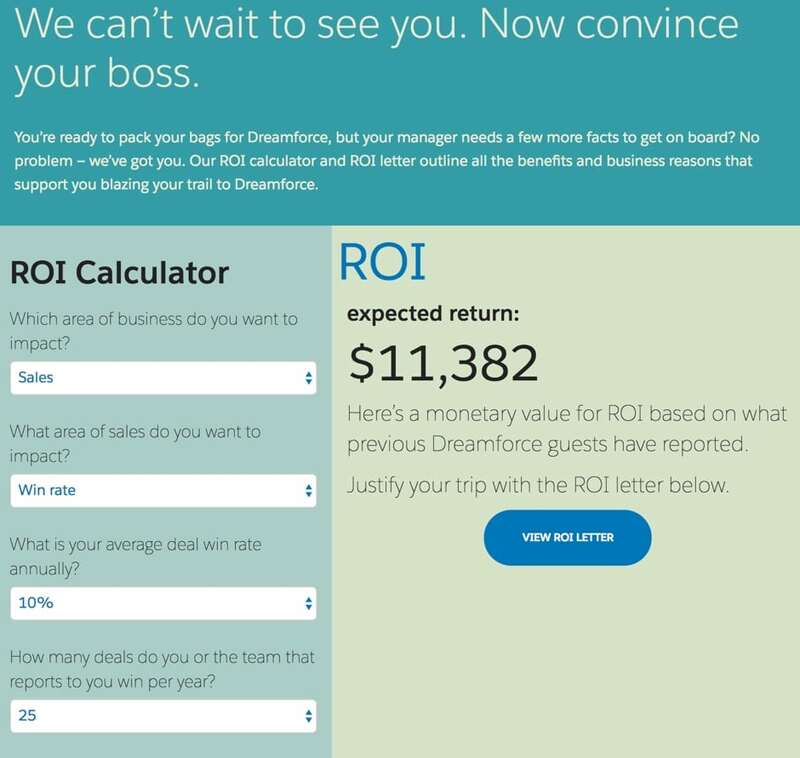 Salesforce have actually put together an ROI calculator, where you can tailor the inputs to your specific business and a dollar amount will be generated based on what previous Dreamforce guest have reported. They make it even easier by providing a template for your business case letter. Just pop in your numbers! Here’s the calculator. 10. Here are the words. Here’s the template. Cut, paste, delete and punch in your details. All ready to submit your Business Case! Is simply to enter our exclusive competition! Talent Hub is taking one lucky winner to Dreamforce this year as the #Dreamhire. All you have to do is secure your next Salesforce role through Talent Hub to be in with a chance of winning. Visit our website for further details!